The role of appropriate therapy in breast cancer survival and survival disparities by race/ethnicity has not been fully elucidated. We investigated whether lack of guideline-recommended therapy contributed to survival differences overall and among Hispanics relative to non-Hispanic white (NHW) women in a case-cohort study. 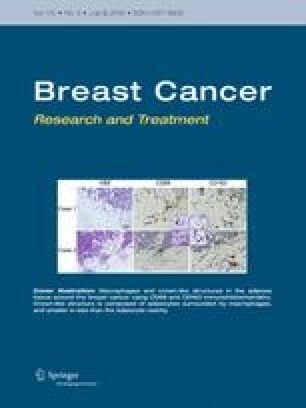 The study included a 15% random sample of female invasive breast cancer patients diagnosed from 1997 to 2009 in 6 New Mexico counties and all deaths due to breast cancer-related causes. Information was obtained from comprehensive medical chart reviews. National Comprehensive Cancer Network (NCCN®) guideline-recommended treatment was assessed among white women aged < 70 who were free of contraindications for recommended therapy, had stage I–III tumors, and survived ≥ 12 months. Hazard ratios (HRs) and 95% confidence intervals (CIs) for breast cancer death were estimated using Cox proportional hazards models. Included women represented 4635 patients and 449 breast cancer deaths. Women who did not receive radiotherapy (HR 2.3; 95% CI 1.2–4.4) or endocrine therapy (HR 2.0; 95% CI 1.0–4.0) as recommended by guidelines had an increased risk of breast cancer death, relative to those treated appropriately. Receipt of guideline-recommended therapy did not differ between Hispanic and NHW women for chemotherapy (84.2% vs. 81.3%, respectively), radiotherapy (89.2% vs. 91.1%), or endocrine therapy (89.2% vs. 85.8%), thus did not influence Hispanic survival disparities. Lack of guideline-recommended radiotherapy or endocrine therapy contributed to survival as strongly as other established prognostic indicators. Hispanic survival disparities in this population do not appear to be attributable to treatment differences. We would like to thank Ms. Kimberly Cooke, Mr. Nicolas Eldredge, Ms. Rebecca Sando, Ms. Chanel Jim, Mr. Francisco Martinez, Ms. Nancy Brito, and Ms. Georgia Hufnagel for their assistance in conducting this study. This study was supported by Grants R01CA132877 and 2P30CA11810 from the National Cancer Institute (NCI) and NCI contract HSN26120130010I-Task Order HHSN26100005 to the Surveillance Epidemiology End Results (SEER) program. The authors declare that they do not have any conflict of interest in connection with this manuscript.